I’ve just moved to this space, so I’ll be republishing a few articles from my old blog. Here is my first post, from way back in 2012. I still feel so very fortunate to have joined the LMB! It has been some weeks since Lhinnthel had the good fortune to be recruited into The Lonely Mountain Band kinship. Her first week went by with a whirlwind of activity! Besides finally Retaking Weathertop after over an hour of sneaking quietly up that high hill (we will now remember to check and make sure she has signed up for a solo adventure and NOT a fellowship one when she is trying to complete an instance! ~Fail.) and successfully finishing her first skirmish with a new Dwarven Protector by her side — Lhinnthel was also trying to learn how to be part of a kin. Being a quiet soul, Lhinnthel is usually quite hermit-like in the social skills department. On one particularly lonely evening, she decided that all of this solo adventuring must come to an end. Timidly, and before she could change her mind, Lhinnthel put in an application to join one of the most exciting kinships she had yet to hear of in all of her travels — The Lonely Mountain Band. I’m fairly sure her application was silly and she may have mentioned a rooster named Gimli. It was a bit nerve wracking to meet a kin officer for the initial interview! At first, Lhinnthel was frightened she would make a bad first impression. She wasn’t frightened for long! The very kind (and very well dressed) hobbit lass, Miss Floradine, knew exactly how to put her at ease with a few merry songs while they chatted near the entrance to The Prancing Pony in Bree. After talking for quite some time, (how did the time fly by so quickly?) 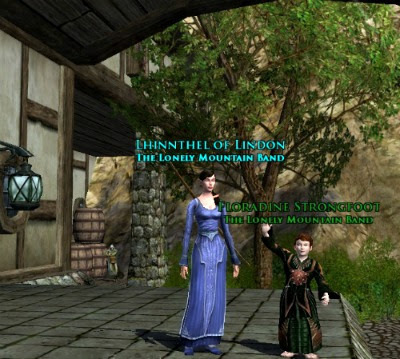 the BIG moment arrived — Floradine asked Lhinnthel if she would like to become a member ofThe Lonely Mountain Band! Lhinn’s heart thumped wildly as she restrained herself from shouting YES! Huzzah! Her very first kin! Lhinn soon realized that if she wanted to become a true member of this wonderful kin, she would have to somehow convince herself that these fine folk were welcoming and just jumping in and participating would show that she want to be there. It would probably also show how little she knew of the world around her as well! Alas, some things cannot be helped. When Lhinn joined the LMB, she had no idea The Windy Acres Ranch and The Lonely Mountain Band were planning a HUGE party that included many fun horse and racing events for the very same week! The Galloping Gala! Taking the plunge to be social, Lhinn signed up to act as a Bookie for the Mithril Cup Race held in Gondamon. It was a lot of fun to collect wagers from the eager spectators and there was quite a crowd standing ’round cheering and talking and waving all at once. Lhinn also served as Bookie for the Bree Cup, an exciting race through Bree Town! She was so surprised when she found out that volunteers were entered in a random draw for a chance to win their very own Perlino Horse! 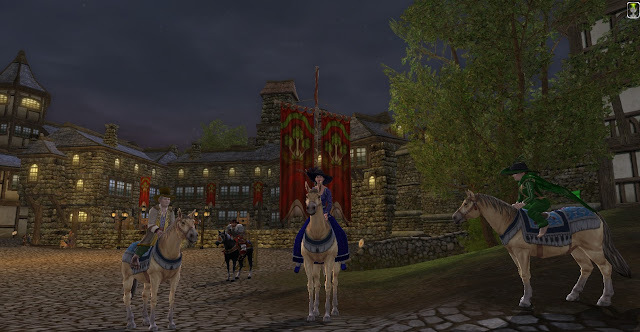 As luck would have it, Lhinnthel was the proud owner of her new mare, Beauty, before the night was over! Many other members were lucky enough to receive one as well. Lhinn and her Perlino Horse – a love affair with mount collecting begins? The best part of the Galloping Gala for Lhinn was the Horse show. There are so many horses and ponies and goats in Middle Earth! Most of them, Lhinn had never even heard of or seen before. It was a wonderful event! 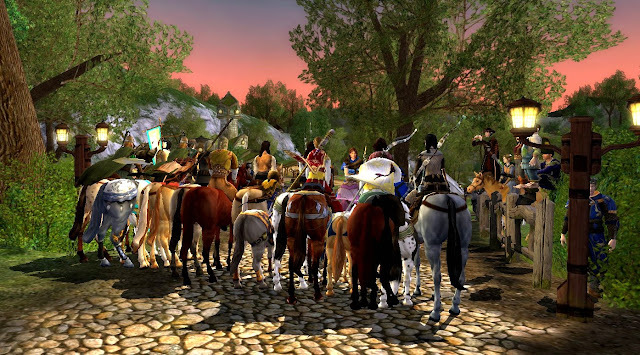 Can you believe this all happened the very first week of Lhinnthel’s kin membership? She can only imagine what other adventures are in store!